Pune and Lonavala: Tata Power, India’s largest integrated power company, has always undertaken initiatives to ensure holistic development of its communities. In line with the philosophy, Tata Power Bhira division undertook the Clean My City campaign at Bhira to raise awareness on a cleaner and greener environment. The campaign was a part of the Swachh Bharat Abhiyan undertaken by the Government of India to clean the streets, roads and infrastructure of the country’s 4,041 statutory cities and towns. Tata Power has always aligned itself with the vision and mission to be a valuable partner in the Indian Growth story. Taking the clean India mission forward, Bhira division of Tata Power had organised the cleanliness drive in the catchment areas. Over 50 school children from Tata Vidyalaya, along with teachers, officers and union employees came forward to be a part of the noble cause. About 150 people were sensitised during the initiative. A lot of tourists visit Bhira every year in monsoon at the catchment areas, and they litter and dirty the areas. The idea is to implement Clean My City campaigns and to sensitise the tourists about cleanliness, nurtured under the valuable guidance of AG Patil, head, Hydros, and GB Deshmukh, head, O&M, Bhira. Drawing competitions were also organised for school children on cleanliness and hygiene. 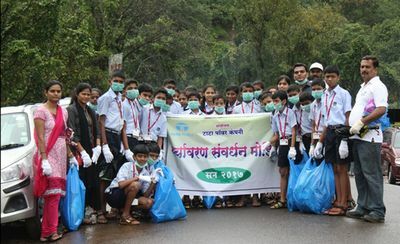 Around 150 tourists were sensitised to keep the city clean and the campaigns and competitions at schools as well as in the areas help in sensitising school kids and tourists across the catchment areas throughout the monsoon to ensure that the city is clean and green. Speaking on the achievement, Mahesh Paranjpe, chief, hydro and renewable operations, Tata Power, said, “Tata Power has always been the partner of progress for its communities and has always strived hard for their holistic development. The Clean My City campaign at the Bhira division is another step forward, which has helped in raising significant awareness among the communities for a cleaner and greener environment. We are thankful to Tata Vidyalaya for their overwhelming support to the cause and making it a great success. We will strive further in future and work with all our stakeholders to ensure holistic development of our communities”. The efforts of Tata Power Bhira division to raise awareness on cleanliness were well appreciated by the locals.